I’m happy to announce the immediate availability of KDevelop 4.1 RC 1. This is a testing release, and any feedback is greatly appreciated. Please send us your feedback either via one of our mailing lists, #kdevelop on freenode or put general bugs and wish request as always to http://bugs.kde.org. We are quite confident that this release is ready for every-day use, and if nothing unplanned happens, we are going to release KDevelop 4.1 in about two weeks. * Nicolás Alvarez: In output toolviews, make sure Select All and Copy only call our slot. * Nicolás Alvarez: Fix toolview button painting to highlight icon on hover. * Aleix Pol: Only add files in case it's needed. * Nicolás Alvarez: Fix comment typos in CMake parser code. * Aleix Pol: Always create a new instance of the QRegExp so that it keeps working when calling the ast parser in parallel. * Nicolás Alvarez: Fix bug interpreting CMake conditions with -NOTFOUND variables. * Aleix Pol: Prevent some crashes when creating a new folder from the UI to a cmake project. * Aleix Pol: Don't add non-cmake folders that contain ".kdev_ignore" file. * Aleix Pol: This folder shouldn't ever have been here. * Aleix Pol: Remove obsolete casts. Bye, happy testing and stay tuned for KDevelop 4.1 final in two weeks. 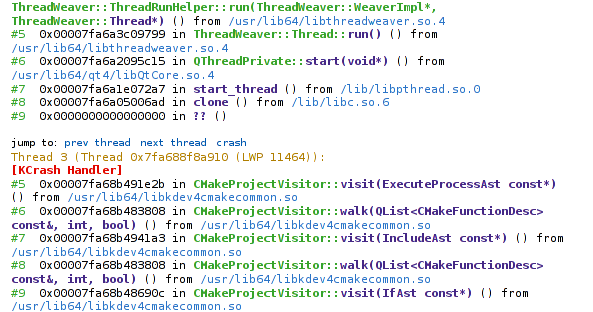 The thing is this: Apparently some global QMutex is getting destroyed by the exit handler but the call to __pthread_cond_destroy does not return. I have no clue on how to fix this. Is there at least a way to find out which mutex this is? Someone told me to have a look in /proc/PID/maps but there I only found out that - what a suprise - ~QMutex is defined in libQtCore.so… Or should I have looked for the this=0xfffffe00 address? Speaking of which - isn’t that address messed up? Pressing crash scrolls the window to the [KCrash Handler] in that backtrace, prev thread and next thread do what you would think they do. NOTE: This also works with Tampermonkey in Chromium! PS: Yeah, we really should get this by default into BKO… I’ll write a mail to the sysadmins now. I’m happy to announce the immediate availability of KDevelop 4.1 Beta 3. This is a testing release, any feedback is greatly appreciated. But keep in mind that it might exhibit unexpected behavior and eat your children. Please send us your feedback either via one of our mailing lists, #kdevelop on freenode or put general bugs and wish request as always to http://bugs.kde.org. * David Nolden: Add some successful tests for macros in include-directives aka "#include MY_MACRO"
* Aleix Pol: Properly provide the build directory for items the parents of which are not build folders. * Nicolás Alvarez: Show correct line numbers in "deprecated CMake command" problems. * Aleix Pol: prevent crashes (assertions) whenever a faulty/unnamed target is defined. * Aleix Pol: Delay actual file removal until files have been removed from the project by the user. Let project refresh infrastructure to care about item removal. * Aleix Pol: Don't create an empty property when an empty one is read. * Aleix Pol: Get rid of the cmake builder interface. It was just used for lookup so it's fine to use the plugin name. * David Nolden: Reset the location-table when re-processing a header with its header-guards disabled. * Aleix Pol: Don't show the folders that doesn't exist on the project tree. * Aleix Pol: Remove unused variable. * Milian Wolff: check for context before accessing it, prevents crash in "rename" and "show uses"
like the "Class" in "int Class::value = 5;"
* Aleix Pol: Do not try to process DVcsJob output when it failed. the user and don't proceed with the Branch Manager dialog. * Aleix Pol: Don't use "git mv" for not versioned files. add files from the Patch Review UI. * Aleix Pol: Fix a couple of wrong messages spotted by Andrew Coles. working sets could simply get lost after closing+reopening the application. * Milian Wolff: Close tab on middle click. Drag'n'Drop reordering is still possible with left mouse button. * David Nolden: Initialize ArrayTypeData::m_dimension in the default constructor. This will silence valgrind for some cases, and might also fix some tiny bugs. * Aleix Pol: Properly retrieve the branch name, now it works when the branch name has '/' in it. * Aleix Pol: Fix naming of the actions as David suggested. Uncomment the Revision History. * Aleix Pol: Don't let the user ask between revisions if there is not at least 2 revisions selected. * Aleix Pol: Make revision intervals a little safer. * Aleix Pol: Make it possible to diff last changes, improve the support to intervals with previous. * Aleix Pol: Add version checks in case it's needed after during the execution. tooltip appearance for some styles. ends up being transparent, which sometime results in widget painting collisions with main panel. "configuration is already opened in KDevelop"
* Nicolás Alvarez: In the save dialog shown on quit, focus Cancel button by default. Bye, happy testing and stay tuned for RC 1 in a few weeks. I was on a spontaneous trip last week and missed the Beta 2 release. Apol took over but my instructions where not clear enough and the packages where totally screwed up (the tags pointed to code in master, no the 4.1 branch). I’m in the process of fixing things up and will create tarballs for Beta 3 and announce it to packagers later today. Lets hope the actual release for users out there can happen later this week. Yeah, I couldn’t sleep well after I put colors on Dr Konqi. I also did the same for Kate, if you did not notice it. There is a new GDB Backtrace syntax highlighting file for it, giving you the same pleasant experience you are now used to from Dr Konqi. Awesome. But well, lets admit it: What use are these two for bug triaging? Visit any crash report on bko and you are left to plain old black-on-white… Stone-age stuff, lets put it on LSD, shall we not? I propose: The GDB Backtrace highlighter GreaseMonkey userscript! PS: How is GreaseMonkey for Konqueror coming along, anyone working on that? Does someone know whether Chrome or Opera could be made to work with this? PPS: We could also install this script directly on BKO, but I fear it might be a tad bit slow, esp. for huge backtraces. Good news everyone, this time in a double feature! Thanks as always to the KDevelop team for making this possible and to the users for giving us valuable feedback. before I go on a short one-week vacation, I wanted to leave you a short note about the outcome of my GSOC, where I tried to revive the Quanta+ brand. the browser preview plugin is supposedly being worked on by another studen in Brazil, I’m awaiting her first results and will polish it together with her. Anyhow, on one hand I’m personally satisfied with what I achieved code wise, esp. looking at the diffs and knowing how many iterations some of the multilang structures required. On the other hand I had hoped to achieve much more. A first alpha release of Quanta is really not visible to me in the near future. But, and here I make a promise I do intend to keep: I won’t desert Quanta. Quite the contrary. KDevelop will probably keep my main focus, but I do intend to improve Quanta, esp. merge the multilang branches into KDevplatform for example. My intended time plan contains a note to merge multilang after the movingrange branches into KDevplatform 1.2. Lets see how that works out. The XML plugin I will definetly continue to polish and make it work as good as possible. Even now it is helpful for more than just web developers: I personally already rely on it when working on Kate language files for example. So there is a personal desire to have it working as good as possible, even though I don’t do much/any web development these days. So anyone using KDEBase trunk will now have a shiny Dr Konqi :) Feedback appreciated, esp. whether more or less should be highlighted. I personally found it overly colorful when I also highlighted pointer adresses (ignore the bug in that outdated screenshot). What do you think? Anyhow, thanks to George Kiagiadakis for helping me find my way through Dr Konqi sources and accepting my feature additions.